1.Quiz: What d0es the law of biogenesis state? "Omne vivum ex vivo". All living things are descended from previously living things. 2. Quiz: What are the minor planets? Asteroids. One of a host of small bodies with diameters of a few 1 00 kms or less, which move in orbits within the asteroid belt between the planets Mars and Jupiter. 6. Quiz: What important discovery did a British naval surgeon James Lind make? That sailors who took lemons on long voyages did not suffer from scurvy. He realised that citrus fruits had medicinal properties. 7. Quiz: What d0es the word Jurassic mean? Characteristic of the Jura Mountains. In Geology it is the middle division of the Mesozoic rocks, which were well developed in the Jura Mountains of the Alps. 8. Quiz: What is heart-rot? Decay in the heart of trees, caused by various fungi. 9. 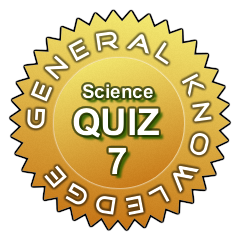 Quiz: The fundamental equation of quantum mechanics is named after the man who developed it. What is it called? 10. Quiz: In March 1986 a European Space Agency space probe plunged through Halley's comet and sent back to earth the first ever pictures from inside a comet. Name the space craft. 11. Quiz: Who, in 1808, isolated calcium and sodium? 12. Quiz: Which is the best month for meteors and why? 13. Quiz: Which is the most distant object in the Solar System that one can see with one's naked eye? 14. Quiz: The man who was responsible for the VS engine also invented the electric self starter for cars. Name him. 15. Quiz: There are two ways of disposing low level radioactive waste - C&C and D&D. What are they? 16. Quiz: Who first used the term 'biocide'? 17. Quiz: What did Charles Darwin call "an abominable mystery"? The origin of flowering plants. 18. Quiz: Saturn is not the only planet with rings. Jupiter, Neptune and Uranus also have rings but they are invisible from Earth. Why are Saturn's rings visible? Because much of it is made of ice. 19. Quiz: What did Eric Fawcett and Reginald Gibson invent in 1933? 23. Quiz: Who made the 1st mobile phone call in India? 24. Quiz: Whom did he call? 30. Quiz: Which number cannot be represented by the Roman Numerical: 0, 0.25, 1/2, 10,000?